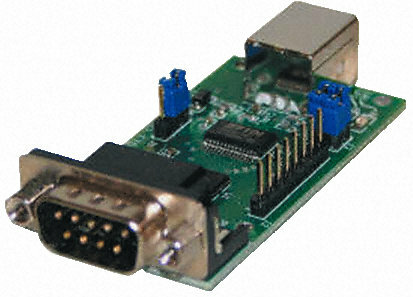 Description: The EVAL232R is a USB to RS232 development and evaluation module for the FT232RL IC device. Additional header pins on the board which provide access to the FT232RL device's configurable CBUS interface pins. Powered from USB, the EVAL232R supports both 5V and 3V level IO interface voltage on the CBUS via a jumper setting. Full RTS/CTS, and DTR/DSR hardware handshaking are supported , DCD and RI are also available. RS232 communication is possible at up to 250kBaud. LEDs are fitted to indicate activity on the FT232RL's TXD and RXD lines, thus showing when the module is transmitting, or receiving data.